As cliche as it sounds, the kitchen is most definitely the heart of our home. It’s where we spend a lot of time together as a family. It’s the place where we love to lounge and have a quick bowl of muesli before starting our separate days. It’s where the girls like to chat and share stories about their day while enjoying an after-school snack. It’s the place where we go to de-stress and unwind after a long day in the office. And of course it’s where delicious hearty meals and calorie-laden but oh-so-scrumptious treats are made with love! My darling husband also fancies himself as a bit of a chef. He loves to cook up a storm and unceremoniously leave a disaster zone in his wake. For some reason he feels the need to use every pot, bowl, utensils in the kitchen whenever he cooks! We have a rule in the house that he likes to enforce – “the cook doesn’t clean”. Funnily this rule seems to get overlooked when I cook! In our last house, the kitchen was a no-frills U-shaped design with an average working triangle. It lacked serious bench space and storage. If Shaynna Blaze was judging that kitchen, you can bet your bottom dollar she’d be screaming blue murder about the lack of storage. It also only had two sets of double power points – not an ideal setup to keep all the kitchen gizmos – the trusty toaster and kettle, Nespresso, cold pressed juicer, high speed blender and the like conveniently plugged in 24/7. 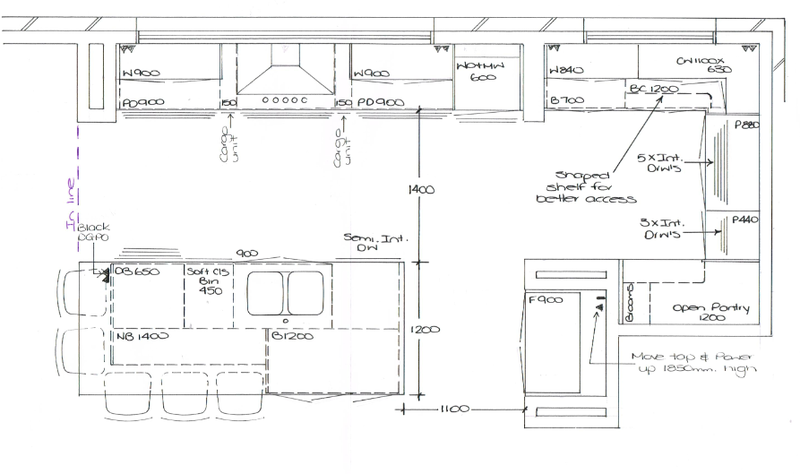 So, when we decided to build our dream house, we had a wish list for our dream kitchen. The standard Hudson kitchen needed a bit of tweaking to turn it into our dream kitchen. 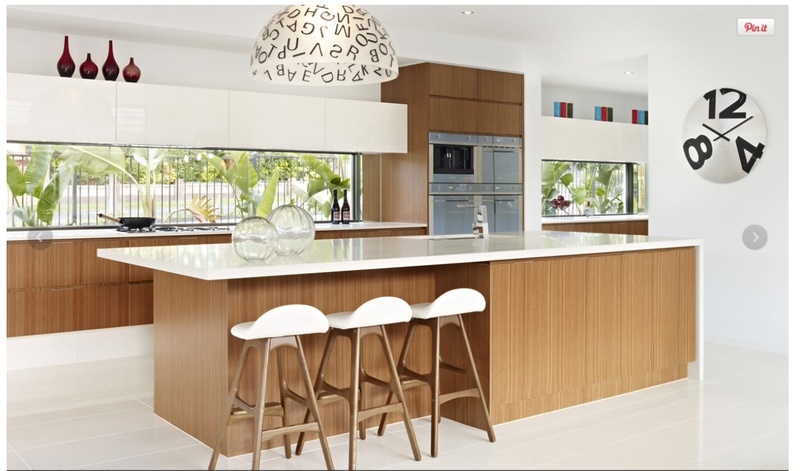 We worked with Metricon’s kitchen consultant to transform our ideas on paper and this is what we came up with. As I mentioned in this post, we were less than impressed and disappointed when we found out what our custom kitchen and butler’s pantry may cost especially when we made it very clear what our budget was. What annoyed me the most is that we had repeatedly requested the pricing ahead of our colour appointment to avoid any surprises. Murphy’s law! So, where are we at nearly 3 weeks after our Studio M appointment? Well, the good news is that most of the other upgraded items we’d asked for have come in under budget. This means that we have a bit more in the kitty to spend on the kitchen/pantry and it’s now a matter of doing the ‘back-and-forth’ dance of revising the design to get the price down to within budget. We are so close to the magic number and I’m finding it so hard to keep my impatience and frustration at bay. We’ll be tackling our pantry storage layout plan in the not-too-distant future. It’s not going to be as big as yours so we need to make the most of the space. I’m kicking myself that I didn’t insist on adding the kitchen/pantry redesign into the contract. I should have trusted my gut feel before signing the contract when the builder was still on ‘sales mode’. We’d be gutted if we now have to compromise the layout we had our heart set on. Your dream plan looks really good. I love that the seating for 5 is not all in a straight row. (Ours is straight – not very creative at all!) A lot of your photos here are just like our house design so I’m feeling good about that! 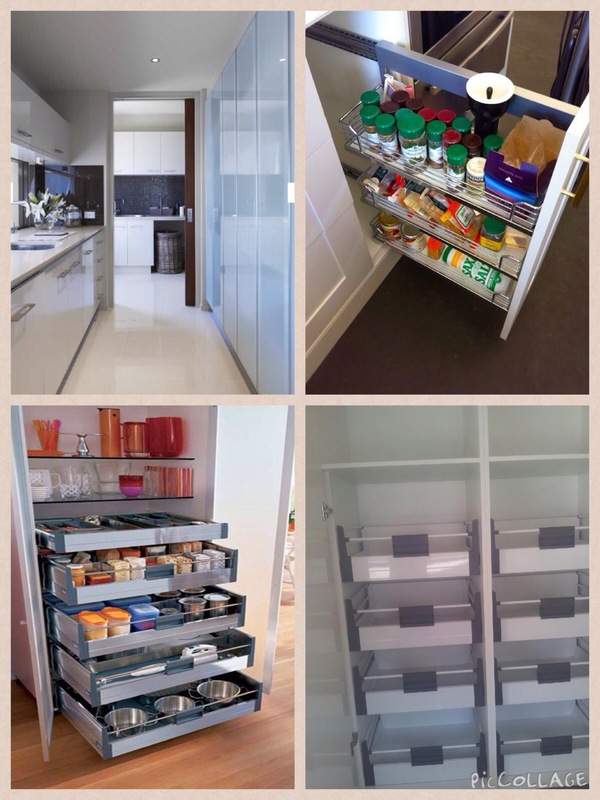 We are having pull out draws in our pantry rather than walk-in-pantry too. I hope you can work it out to conform with your budget. P.S. My husband has similar enthusiasm for messy cooking! It seems to be a common thread that kitchens run over budget. We are just waiting on a quote from our cabinet maker. We did try to include as much as possible in the addenda but we have changed a few things so it is bound to be more – it is never less ! Thanks Deb. We are still waiting to finalise kitchen and the rest of the interior selections. I can’t believe we had our DA approved before we’ve signed off on the paperwork. Joys of building!